Connect with worldwide mobile phone users using bulk SMS software!!! Now you can connect with multiple people simultaneously by sending bulk number of text messages using professional bulk SMS software. Professional bulk SMS Software provides reliable solution to send thousands of text messages simultaneously using USB modems, Android, GSM, Windows mobile phones. Software allows you to compose and send multiple text messages from PC without any requirement of internet gateway. → Helps you to communicate with target mobile phone audience. → Does not require internet connection to send bulk number of text messages. → No hidden or installation cost only one time payment. → Useful for marketing business products, brands and services. → Increase business sales and revenue by sending bulk SMS to your customers. ◉ Bulk mobile text messaging software conveniently sends multiple text messages using USB Modems, GSM, Android and Windows based mobile phones. ◉ Bulk SMS sending program supports different Unicode languages to send messages in any text format. ◉ Bulk SMS sender software has inbuilt delay delivery option to control the load of bulk SMS broadcasting. 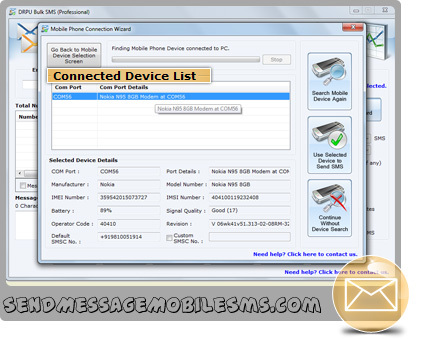 ◉ Bulk SMS software provides facility to send standard messages or notification. ◉ Bulk text message software provides inbuilt list wizard option to maintain list of contacts or groups. ◉ Mobile messaging program provides facility to save sent messages information that can be viewed by the users later. ◉ Mobile text message software easily works on all USB modems, GSM, Android, as well as Windows mobile phones.